Are You Thinking About Becoming a Professional Organizer or a Productivity Consultant? Q1. What is the difference between a professional organizer and a productivity consultant? Q2. I've always been an organized person and people constantly comment on my organizing abilities. Does this mean I will make a good professional organizer? Q3. Are there other classes I can take to learn how to be a professional organizer/productivity consultant? Q4. Can I make a living being a professional organizer/productivity consultant? Q5. How do I get hands-on experience before I start taking clients? Q6. Do all organizing and productivity professionals do the same thing? Q7. Are there any rules or guidelines for professional organizers/productivity consultants? Q8. How do I find out more about becoming a professional organizer/productivity consultant? Q2. I've always been an organized person and people constantly comment on my organizing abilities. Does this mean I will be a good professional organizer? While being organized is a definite asset, what works for you personally might not necessarily work for the client. The critical skill that a professional organizer must have is the ability to create customized organizing solutions that work for the client. 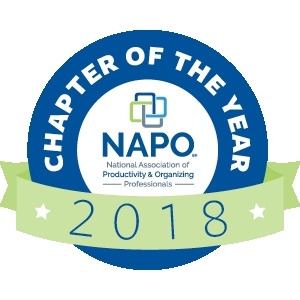 If you are not sure you want to become a professional organizer or productivity consultant, you should consider taking the following courses from NAPO University. Yes, two resources include NAPO and ICD. NAPO University offers exceptional learning opportunities to professional organizers and productivity consultants. Taught by experts in the industry, NAPO University’s course offerings cover the fundamentals of the profession as well as advanced training in multiple topics, enabling you to deliver the highest-quality service to your clients and to run your business successfully. ICD (Institute for Challenging Disorganization) offers teleclasses designed to enhance knowledge and effectiveness in working with the chronically disorganized population. Presenters vary from ICD subscribers to Ph.D. experts in various fields. Public awareness of the organizing and productivity industry is increasing and stimulating the demand for these professionals. As in any service profession, there are many variables involved in the success of a business. Your marketing efforts, your skill level, the amount of time you devote to it, and even your geographical area can affect your business. Try your skills on your own home or office. Contact relatives, friends, and colleagues and offer your services in projects such as closets, home offices, time management, or any area needing help. Request an honest assessment of your work. You might also ask a seasoned professional if you can accompany them on a large project to observe. Organizing and productivity professionals can assist clients with home office organization, time management, corporate efficiency, specialty projects (from organizing photos to cataloging inventories), virtual organizing, working with hoarding and chronically disorganized clients, downsizing, and moving and relocation. There are virtually no limits when it comes to what you can pursue within this profession. Many organizing and productivity consultants are also independent business owners, and there are no specific regulations or rules in the organizing profession. What sets NAPO-DFW members apart is that they agree to uphold NAPO's Code of Ethics, which establishes guidelines for professional conduct with our clients and with other industry members. Beyond fundamental professional ethics, creating your own professional focus and methodology comes from training, experience, and education. Contact NAPO Membership and do research online about the industry. You will also want to research how to establish a small business. 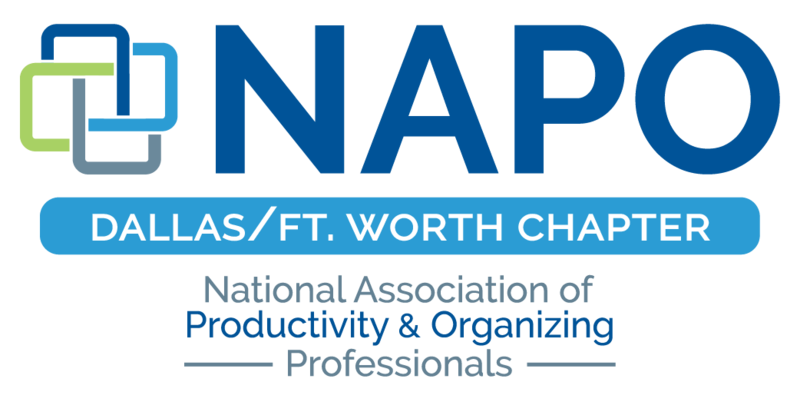 Visit a chapter meeting at NAPO-DFW to discover what our professionals are doing. Membership allows you to exchange ideas and information with other members and adds to your credibility as a professional in this field. See benefits of membership for a list of all the benefits.